Robotics fans who are also entomologists should get a kick out of the latest high-tech machine from Japan - a shiny multi-legged robot that can walk like an insect. 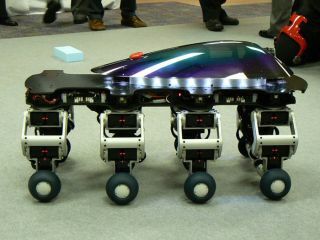 The 20kg Halluc II from the Future Robotics Technology Center ( Furo ) at Chiba Institute of Technology and Leading Edge Design in Tokyo has eight limbs. And one of its three modes of locomotion is based on the way some insects walk. The other two see it move on wheels like a car and in a way similar to a quadrupedal mammal, albeit with twice the complement of limbs. The point of developing a robot that can get around in such differing ways is to create machines that can traverse any kind of surface. Halluc II can't handle stairs when trundling around on its wheels. But break out the crawling insect legs or stepping mammalian feet and it can scurry or stomp with the best of them. If all that sounds a little esoteric, we advise you to check out the excellent videos over at Japanese site Robot Watch , particularly the insect mode here and the transition between insect and mammal here . Future applications for such technology could also see, for example, cars that can park in tight spaces by sprouting legs and simply stepping sideways into the gap. We can't wait.